Today is a very proud day at Hawkesmill headquarters. Because today we officially launch our new website. You see, when we created our camera bags and straps we initially had no idea how many people would actually buy them. We knew our designs were unique and we also knew that most photographers don’t like to stray too far outside their comfort zones and adopt new, unproven technology. This is true for cameras and lenses, but it is also true for bags and straps. Well, even we didn’t foresee just how much photographers were waiting for a brand like ours to emerge. As it turns out, we’re not the only photographers who thought the current camera bag and strap offerings were dated, boring and mostly all use the same construction techniques and materials. Within a few months we had sold out of our initial order of camera messenger bags, like our incredibly popular Jermyn Street bag. A few months later we launched our small camera bag range and with a little help from DPReview we sold out of our first all leather camera bag, the Regent Street, the world’s first camera bag made from Horween Chromexcel leather. Our straps proved equally popular and by the beginning of 2017, just 8 months after we launched the company, we had to re-order both our Westminster and Borough straps. We’ve also added several other straps to our camera strap lineup, including: the Kensington strap and the Oxford wrist strap. On behalf of all of us here at Hawkesmill I would like to say a great big, thank you! Thank you for the support. Thank you for taking a chance on a company that doesn’t conform to the normal rules and that is following it’s own destiny, making, what is in our minds, the finest camera bags and leather camera straps you can buy. Proudly hand crafted in England. If we can improve in any way please let us know by contacting us or leaving a comment below. 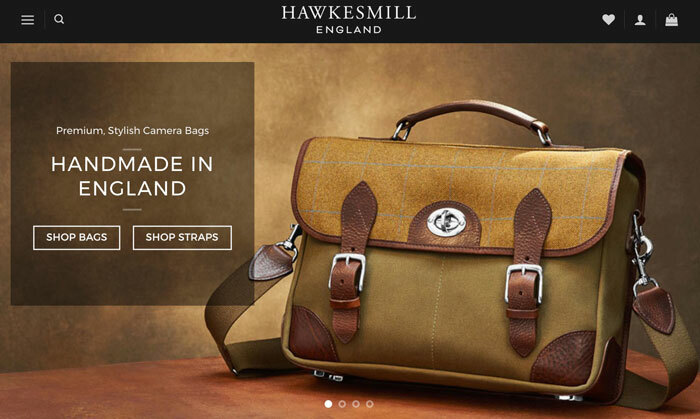 This entry was posted in News and tagged Camera Bags, Hawkesmill, Leather Camera Straps, New Website, News.